I am more amazed than I can ever say. The following article doesn't surprise me, but it's good to hear it reported by the BBC, although they couldn't resist getting someone in to poo-poo the report's findings and denominational schools in general! (the Rabbi from the Accord Coalition). Campaigners against faith schools say the Ofsted checks do not go far enough. This is quite frightening and confirms something I have long believed... basically that the brain is more subtle and complex than what even the most up-to-date science can say about it. How many people in this situation have had life support turned off? Medical staff believed Rom Houben had sunk irretrievably into a coma after he was injured in a car crash in 1983. A doctor at Belgium's University of Liege who discovered that Mr Houben had been misdiagnosed said his case was not an isolated one. "I was shouting, but no-one could hear me," Mr Houben, now 46, was quoted as saying by a German magazine. Bro. Marcel (Canada) with Mgr. Richard Domba, Bishop of Dungu (Congo) who was staying in our General House while we were there. The new logo for the celebrations of the 150th anniversary of our founder, Jean-Marie De La Mennais' death. Bro. Francis (Uganda) and myself with our Superior General, Bro. Yannick Houssay (seated). Evening sing-song with the Brothers of the General House community. The Superior General entertaining us on the piano. Secretary General, Bro. Pierre Berthe (far right) our guide for our day in the centre of Rome (Vatican Radio, St. Peter's, etc...). The Commission for Information + Communication is dead... Long live the La Mennais Media Team!! The Lamennais Media Team with Fabio (far left) our main website's webmeister and far right Fr. Louis Balanant, ex-Assistant General, current Congregation Bursar, assistant web designer to Fabio and prime mover in getting our first website up and running some years ago. Not bad for a guy in his mid-70s! Here at last is some info (in note form) on the outcome of our 6 days of meetings in Rome (see a few articles back). There was much brainstorming throughout the week as regards our publications, websites, blogs, other internet (web 2.0) media such as YouTube, Facebook, etc..., video resources in general, preparations for the 150 anniversary of our Founder's death next year in 2010, etc... Lots of ideas, lots of initiatives (some already under way) and an understanding of how important our work is to be for the whole Mennaisian family. Fr. 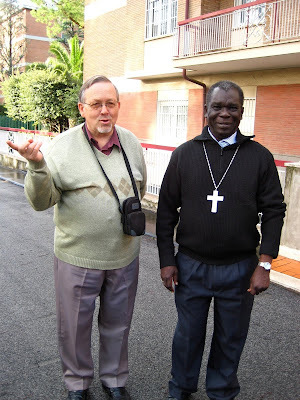 Yannick certainly thinks so (= Superior General, with us in our meetings at the beginning and the end of our week). "There’s no pleasure like meeting an old friend except, perhaps, making a new one. " Rudyard Kipling. I've experienced both pleasures since I moved back to Southampton in August after a gap of 22 years. Some of those from the past that I have become reacquainted with include parents of former primary school classmates, former classmates themselves at both primary and secondary school, friends of our family as well as actual relatives who live in the area many of whom I have only seen at weddings and funerals over the years (cousins galore, a few uncles and aunts). I've been surprised by how much these encounters have meant to me. There are also those with whom I have kept in regular contact over the years whom it is a pleasure to now be able to see more regularly again. I think Pope Benedict is very much in favour of making the most of new technologies as means for evangelisation, but judging by some of the faces of the Cardinals listening to him, I'm not sure they all share his enthusiasm!! Remembrance Day - "Black Swan Song"
Yesterday I had a surprise e-mail from, David Pott, the father of Joel Pott (lead singer of Athlete). He had found my blog entry about his son's song "Black Swan Song" written as a tribute to Joel's grandfather who died 3 years ago (see a few posts back - Oct. 26th), a veteran of the ill-fated Battle of Arnhem, immortalised in the blockbuster film "A Bridge Too Far". Joel's father thanked me for my article and offered suggestions as to how the song's video (see here) and a documentary produced to coincide with its release (see below) might be used in school R.E. lessons together with some other resources. An amazing music project, with performers recorded individually around the world for a CD + DVD, that wonderfully highlights the rich tapestry of human culture(s) and shows the power of music to unite, to create fraternity and through that unity to communicate a joy that is contagious. "Playing for Change is a multimedia movement created to inspire, connect, and bring peace to the world through music. The idea for this project arose from a common belief that music has the power to break down boundaries and overcome distances between people. No matter whether people come from different geographic, political, economic, spiritual or ideological backgrounds, music has the universal power to transcend and unite us as one human race. And with this truth firmly fixed in our minds, we set out to share it with the world." Watch + listen to this amazing version of Stand By Me (takes a minute or so to really get going). 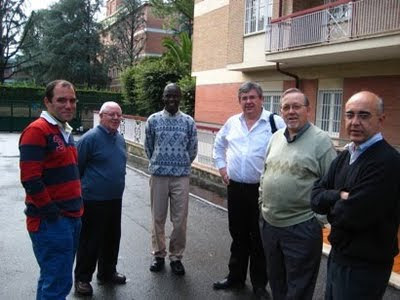 Two days ago I arrived at our General House (Headquarters) in Rome to meet with 5 other members of an international De La Mennais Brothers commission for Communication + Information (4 Bros. + 2 lay people from France, Uganda, Canada, Uruguay, Spain + me from England). The other five members of our team and a Brother (2nd left) from the General house community that has welcomed us for these 5 days of meetings. 3 Go Mad At Fordingbridge - the report! 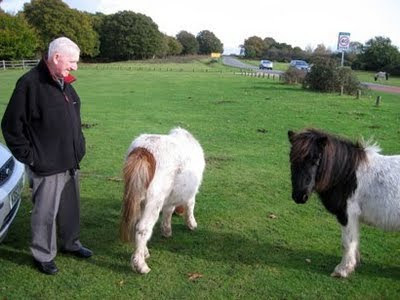 We (Bros. Francis, Gus + myself) ended up having a most pleasurable afternoon, beginning with a drive into the New Forest, dodging the wild (but sedate) Forest ponies as we crossed the heathland. This was, after all, their territory, and they let us know it, wandering ever so slowly out into the middle of the road as you approached. It made sense of why there is a 40 mph speed limit on the Forest roads, and also why there are so many signs warning of the dangers of colliding with the animals (there are also cattle, deer and pigs to be seen a-wandering). Bro. Gus with some new friends.